I’ve got two words for you: Southern Cooking. After a couple of days in Atlanta, Bonnie and I headed up to the boarding school where her Mom (Holly) and step dad (Nick) work and live. The school is called Rabun Gap and is located in the mountains (hills) of North Georgia, just below the Carolina border. Simply put, the place is gorgeous! Out in the middle of nowhere, the campus is wide open and surrounded by nothing but green rolling hills (mountains, if your from Florida). To keep with the theme, on our first night in town Nick made a huge BBQ feast: Monster Ribs, which were so big I literally think they came from a monster, grilled peaches, coleslaw, and some grilled sweet potatoes! And if that wasn’t enough, the next day Nick’s parents treated us all to the world famous Dillard House where the food just wouldn’t stop coming!!!! Last, but not least, we can’t forget Nick’s Mom’s homemade Strawberry Ice Cream… Delicious. Once back in Atlanta, Bonnie and I headed to Braves’ baseball game with her Aunt/Uncle/Cousin. 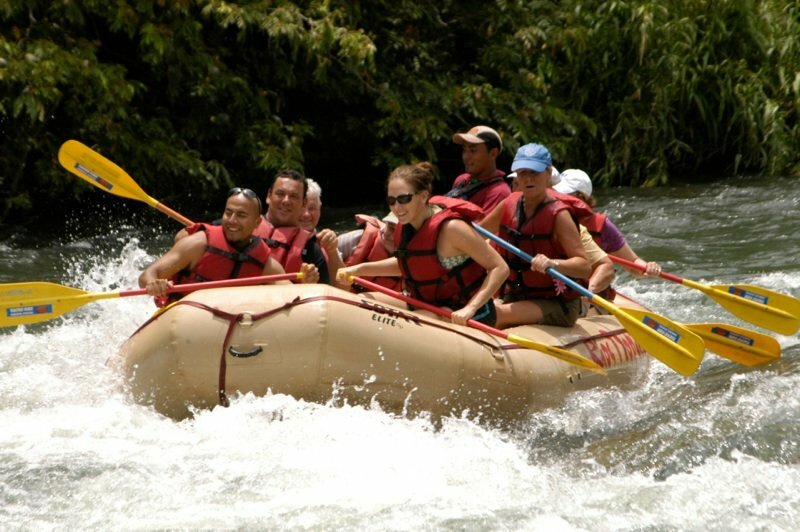 Because I didn’t take any pics in ATL, I used the one from our Costa Rica Rafting trip above since the disc the rafting company sent just arrived today.